This striking cowhide rug is everything you’d expect from a premium cowhide rug, without the premium price tag. The markings on each cowhide are individual so you know you are getting yourself a truly one-of-a-kind piece – we photograph each and every cowhide rug, so the cowhide shown in the picture is the exact one you will receive. 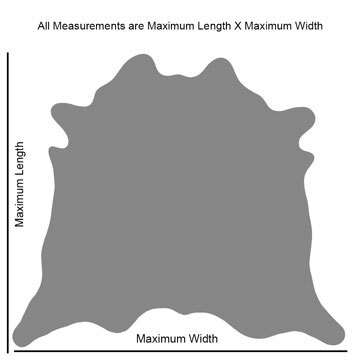 This cowhide rug measures 230cm x 200cm – measurements are taken from the widest and longest points of the hide. This cowhide rug originates from Colombia and has been hand-selected for its natural beauty and unique markings. It has been chromium tanned for durability and resilience, ensuring this cowhide rug is able to withstand any of the anticipated spills and stains from even the busiest households. Most stains will be easily removed using just a mild soap solution and damp rag. For an even more dramatic effect why not pair this rug with a couple of matching cowhide cushions? This stunning cowhide rug will blend seamlessly with most interiors whether your décor is traditional or modern. With over ten years as the UK’s leading cowhide rug supplier we’re not satisfied until you are, and we take great pride in bringing you the UK’s largest collection of cowhide rugs. Taking care of your cowhide rug could not get much simpler! A weekly shake outside will freshen up your cowhide rug and remove any loose dirt or crumbs. If necessary, you can vacuum your cowhide rug, but we recommend using the attachment on a medium setting. Always vacuum in the direction of the hairs for best results. Wipe up any spill immediately with some kitchen towels and wipe away stains with mild soapy water and a damp cloth.